At the start of Session 12 of TEDGlobal 2010, Chris Anderson announced a mystery guest. 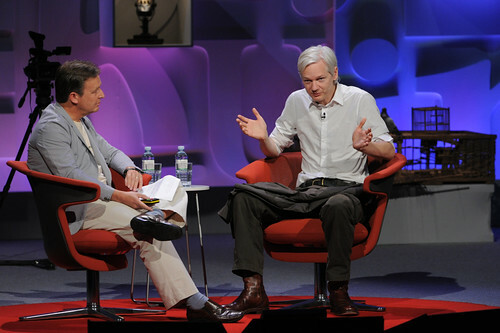 “There’s a site some of you may know, called WikiLeaks.” WikiLeaks founder Julian Assange steps onstage for a surprise appearance at TEDGlobal 2010, in a Q&A with Chris. And yet, and yet, no video. Attended the talk, very interesting. Some good questions from Chris as to what must be protected for national safety reasons. I was watching the live feed of the conference. Why did I miss him? Whyyyyyy? TED please get this uploaded as soon as possible.